Ecotec powered 1980 Chevy Luv - bitchen! Truck looks to be in pretty good shape. Can't remember last time I've seen one! depending on the year of that g5 it may not be the best donor. 05-06 cant be tuned with hp tuners, so unles you plan to go stand alone the ecm and harness may be no good to you. if your wanting an l61 look into a cavalier/sunfire ecotec with ecm and harness. they are cable throttle and dont run mas air flow. They are mostly out on the west coast, and there are fewer down south. For one to be in the northwest is unheard of! I was aware of the tuning issue with the early Cobalt's. This car is an '09. Would it be possible to convert the later L61 to cable throttle? wouldnt an 09 be an LAP, not an l61? you wont be able to run cable throttle with that ecm. the late model computers are not designed to control an idle air control motor as idle control is done with the electronic throttle. running the electronic throttle shouldnt be a problem, just more to worry about. also, running an early ecm on the later l61 (or possibly lap in this case) is a no go. the crank reluctor is different and late model went to coil on plug ignition vs the coil cassette of the early ecotec. Derp. Yeah, its a LAP. I called like 5 different places today and a couple of them were L61s, but they wanted an arm and a leg. This G5 is at some guys house and he just wants it out of his yard. the LAP wouldnt be a bad start, especially for your end goal. a set of rods and pistons, maybe a balance shaft delete, good to go. could always leave it stock and keep the boost down and get the truck sorted out and build an engine later. im not very familiar with the LAP, but if things like the crank and cam reluctor wheels and sensors are the same as an LE5, building a 2.4l down the road could be another option. and for $600 you likely could sell the trans and some other parts off and get most of your money back. nothing wrong with starting with a "free" engine. its kinda funny, where i am l61s have never been worth anything. when the ecotec first debuted in the j body junkyards were selling package swaps to replace the 2.4l twin cam (motor, trans, ecm, harness) for $600 canadian, was the only way they could sell the engines. now most of the cars that need engines arent worth the money to fix them, so they get scrapped. the pick a part yard it filled with them, and they are $125 for a long block, a complete engine with a harness and ecm is under $250. There are a couple junkyards around here asking $500 for L61s. One had "hole in oil pan" in the description, and the other said "motor noisy". No thanks lol. Like you said, if I can pick this up, at least it will get the project rolling. I can always switch it up, or build up another one down the road. Do you have any pics of what you did for motor mounts? All your picture links are broken. i have a habit of using facebook to host my photos, and after a while the links expire. its about as simple as it gets. some 3/16 steel plate, 1 5/8" od tubing and a couple urethane flanged bushings. i would recommend against using urethane in this configuration, the vibration was terrible, i swapped mine for rubber after a short time. Went to check out that G5 today, and the guy didn't get a key when he bought the car, so he had drilled out the ignition thinking that he could just start it with a screwdriver....needless to say, that didn't work. I might let him sit on it for a bit, as I doubt he will be able to get it running. Then maybe I'll offer him less before trying to rig it to start myself, which might not even be possible? Last edited by AHelm3; 10-03-2016 at 09:04 PM. the bosses on the block are at different elevations. that was during fab, i made proper spacers for final assembly. yea thats gonna be an issue to get running. if apply 12 volts to the signal wire on the starter it will crank over and may start for a couple seconds before it dies, that will be because of the security key. should be able to go in with hp tuners and disable the vats and it will then run. I know they are ar different heights. I was saying that to see if your were going to say who cares or if youvmade shims. Good deal. no im not a hack. ideally i should have made steel spacers and tig welded them on to the plates, but i didnt have any steel stock when i needed to make them, so aluminum it was. Haven't been working on this thing at all, because I've been waiting to see if this frame swap was going to work out. Saturday, I'm loading my 4x4 frame up on the trailer, and hauling it out to Ohio so I can pick up the 2wd roller! New frame is situated in the garage. Now I can start cleaning it up and getting it ready for the cab to be set back on. Still keeping my eyes peeled for a donor car. Although there are a couple Copart auctions that I'm watching coming up, so hopefully I land one of those. 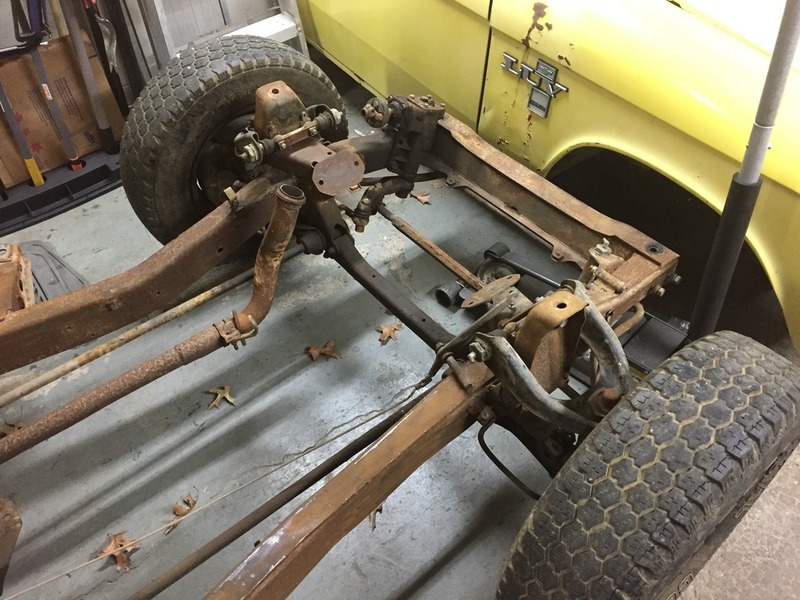 While I had the old frame out of the garage, I decided to lower the bed down and "reassemble" the truck to get an ideal of the final product. Hopefully giving me some motivation. Like the "reassembled" look, planing on making it that low? It won't be that low to start with. 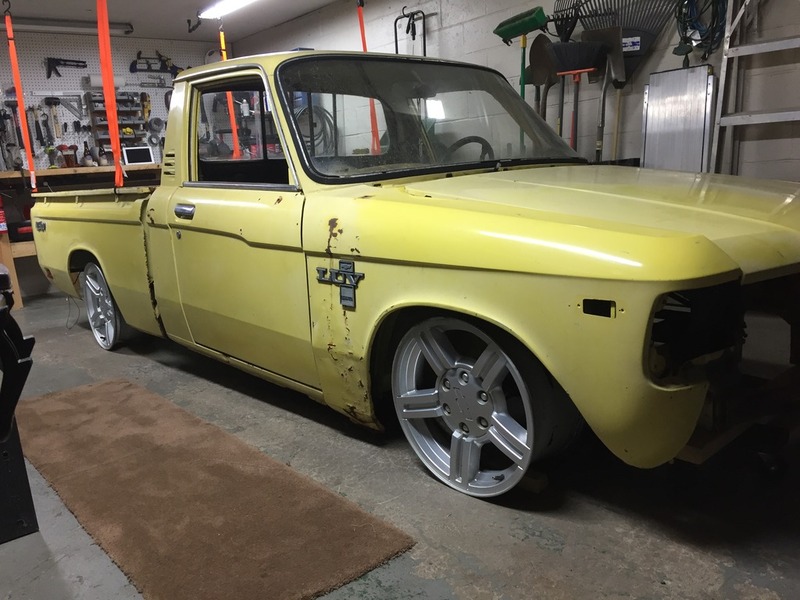 The front wheels will sit a quarter inch or so past the fender, so by the time I get a tire on them, the truck will have to sit a good bit higher than in the picture. After I get it running and driving, I might look into narrowing the front track width so I can drop it down some more. I've been keeping my eye on some of them, but they still bring a pretty decent premium, not to mention shipping and gate fees. I'd be looking at $2k all said and done for a donor car. House renovations and the holidays kind of have a strong hold on my budget right now. I'd end up divorced if I spent that kind of cash on a wrecked car lol. There is an 09 Saab 9-3 with a B207r up in Elwood right now that I'm going to try and win the bid on. Love the look of it like that. 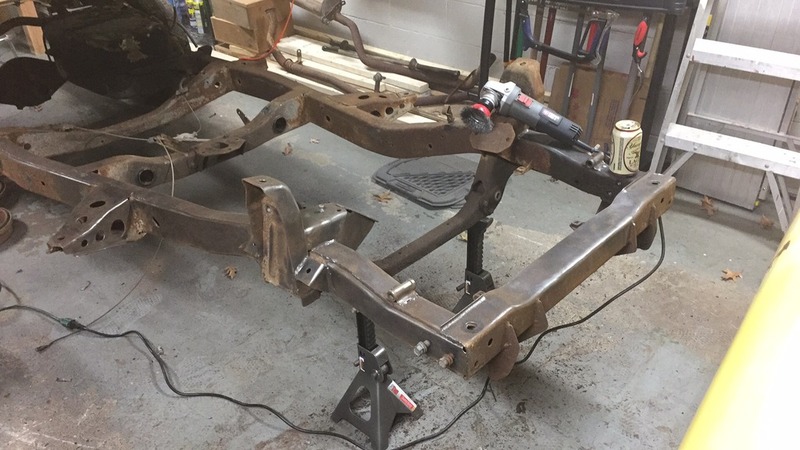 Got the front of the frame striped of all the suspension and cut out the exhaust. Cut and ground off any unnecessary tabs and started hitting the frame with a wire wheel. This thing is cleaning up great! yuengling in a can?! cant even get a bottle! Lol, I usually keep cans around the garage. I can keep more in my mini-fridge, and I don't have to worry about breaking them if they get caught by an air line or extension cord. I'm going to coat it with something similar once it's all stripped and clean. Not sure if you have been scouring Car-Part.com at all but I had good luck using this site when I was looking for a replacement motor. I ended up scoring a '07 LE5 (with forged rods) to replace my blown '08 LE5. The new motor had 1013 miles on it for $650 with a 6 month warranty. The LE5's seem cheap to get because they are so abundant, being a "world" engine and all. Also, they are still like the base engine on everything in the mid-size and crossover segment.